Is Penne alla Vodka A Traditional Italian Dish? Is Penne alla vodka a traditional dish found on menus across the Italian boot? The answer depends on who you talk to. Certainly it is a dish that frequently appears on Italian American restaurant menus. I personally have never seen this dish on any menu in Italy. I have asked countless Italians friends from the north to the south if they know of this dish and they just give me a quizzical look. 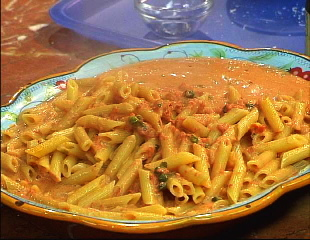 Penne alla vodka is nothing more than a tomato sauce laced with cream, vodka and hot pepper paste. It's used to dress a slant cut of pasta called penne (which means pen). According to some foodies, the original recipe called for pepper flavored vodka, but now hot pepper paste has taken its place. In the research that I have done, it appears that this dish was introduced into Italy sometime in the early 1970s. It was brought by vodka distillers who wanted restaurants and their chefs to promote the consumption of vodka to the Italians. Besides enjoying it in chilled vodka glasses, they even suggested that Italian chefs dream up ways to cook with it! So this may have been when penne alla vodka appeared in Italy. The craze did not last long because Italians are very fussy and traditional when it comes to tinkering with their national dish. They frequently add wine to tomato sauce but vodka? Not in my grandmother’s day. How about the cream? Again, tomato sauce hails from the south of Italy, particularly the region of Campania and being of Neapolitan ancestry, I can tell you that cream is not a traditional ingredient in tomato sauce. The debate will rage on but meanwhile if you want to make this dish, here is my take on it. Really interesting story about Penne a la Vodka. I have wondered for years as to its origin. It's a nice change now and then but I still prefer the Bolognese. The exact origins of penne alla vodka are unclear. 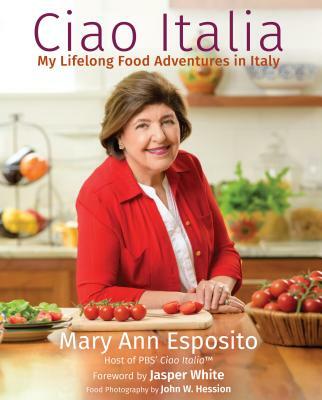 In her book Food for Friends, Barbara Kafka writes the dish was common in Italy before becoming popular in America in the early 1980s. Grappa, essentially a grape-based vodka, is occasionally used as an emulsifier in Italian cooking. There have been multiple claims to the invention of the dish. According to Pasquale Bruno Jr., author of The Ultimate Pasta Cookbook, penne alla vodka was invented at Dante, a restaurant in Bologna, Italy. Other historians of the culinary arts recognize James Doty, a graduate of Columbia University, as the inventor of penne alla vodka. The Williams Sonoma Essentials of Italian cookbook states that it was invented in the 1980s by a Roman chef for a vodka company that wanted to popularize its product in Italy. In fact, I had never heard of penne alla vodka before and I lived in Italy for more than 15 years in my life. Vodka alone, is not even an Italian national alcoholic beverage to begin with. Similar to France, Italians would normally use White wine or Red Wine instead of vodka or something like beer or stout. Also butter is not commonly use since Italian cuisine is a Mediterranean cuisine but they use Olive Oil Extravirgin instead. Also, dairy products such as butter and panna or cream do not go with sugo or tomato sauce. Some would say that acids in tomato is incompatible with cream and making cream a bit too sour. The only exception is the grated Parmigiano Reggiano or Pecorino Romano or Grana Padano cheese that would be sprinkled on pasta after it was served. Another thing strange that I noticed, coming from many American chefs is that they would use chicken or poultry meat as pasta's condiment but in Italy I never heard of that too. Italians tend to see chicken or poultry meat as the main course or second dish which does not go with pasta such as Pollo e Patate al forno or Pollo arrosto con patate al forno (Roasted Chicken served with roasted potato). It is very strange for Italians to see chicken meat in their pasta dish. Some would even ask that what is this chicken doing inside his/her pasta dish??? So yeah, Penne alla vodka is definitely not Italian similar to like Pasta Alfredo (not pasta al freddo which is cold pasta served as pasta salad). Italians are extremely complicate especially when it comes to eating. Just by seeing this recipe, it might be enough to make them laugh. REDITED: "Another strange thing that I noticed..............................."
I lived in Italy for three years 1973-1976. My first job was dishwasher at a french restaurant in Perugia, La Bocca Mia. They served Penne alla Vodka at that time.